Unique 4-sided table is ideal for snacks, games, crafts, picnics, and more! 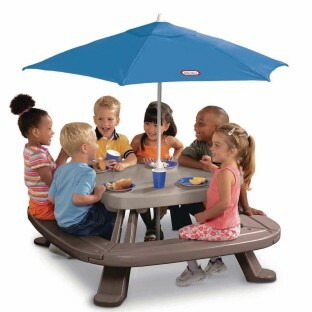 The ultimate kids' table, this unique 4-sided table is ideal for snacks, games, crafts, picnics and more! Natural, wood grain look and color helps it blend in with other outdoor furniture. Center hole holds a market umbrella (included). Assemble it once, then fold, move or store it anywhere. Compact design hangs easily on a wall. Sized to seat 6 to 8 children comfortably. Ages 2 to 8 years. Made in the USA.